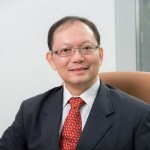 Paul Ho (iCompareLoan.com) 27 May 2017. Although labour participation hardly moved at around 62.9% (and it still not back to its previous high) and core inflation has dropped from 2.4% to 2.2% in May 2017. The Federal reserve targets the Core Personal Consumption Expenditure inflation at 2%, Core CPE inflation above 2% is considered as a sign of overheating. A drop in inflation reduces the chances of a rate hike slight. Note: The Core Inflation includes food and energy prices while Core PCE excludes Food and Energy prices and Core PCE is slightly lower than Core inflation at this point in time. 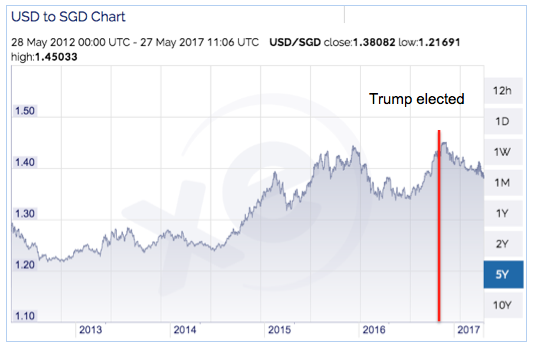 However some of Trump’s policies will take time to materialise, hence that was probably the reason a stronger USD did not materialise versus the Singapore dollar and the USD started to weaken against the SGD. If the June rate hike materialises, then it will be good to observe if the USD starts to strengthen against the SGD. As globalisation forces countries to be more and more in lock step with each other, especially the relationship between the Federal Reserve Funds rate and that of Sibor. Take a look at this chart, you will see that Federal reserve overnight target funds rate are scarily correlated with Sibor, despite the interest rate differences. The pattern is similar. For those who are unfamiliar can read more about what is Sibor or SOR. If the Federal Reserve Open Market Committee meets on 13th and 14th June 2017 and decides to raise interest rates, there is a high chance that Sibor will follow suit to rise or it could rise in anticipation closer to the date. When the rate hikes and Sibor rises, Singapore banks will start to adjust their fixed rate home loan packages as their cost of funds rises. New Launch BUC condominium – What home loan packages to choose? 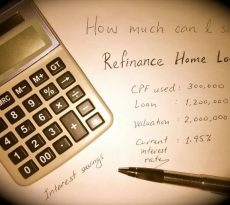 If you are buying a new launch condominium that is uncompleted, generally referred to as building-under-construction (BUC), fixed rate home loans are not available for BUC, but you can consider refinancing to packages that are pegged to fixed deposit. We cannot be right all the time, because many political events or economic events can still change the trajectory of the charts. Just take your own precautions based on your family’s financial situation. 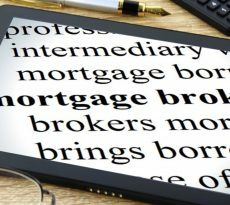 You can get in touch with a Mortgage Broker to discuss your property buying financing options.